1. Will I be making money of my friends? No. We just pay you for advertising from our marketing budget. Rewards are accumulated when others use your links/banners to place an order. Rewards can be used towards purchases on 4-Hobby.com or can be redeemed for cash (PayPal payment). 3. Should I be your customer in order to earn Rewards? No. You never have to buy products from us and resell them. If you're happy with our products and service, your feedback will help to your readers. If you just like our site but not purchased yet, just let others know about our business. 4. How do "levels" work? Put your banner/link on your site, blog or forum post, Facebook page, Twitter, Instagram etc, send it by email to people who may be interested in embroidery designs. Anyone who enters to our site using this banner/link and make purchase, earns you a 10% reward - based on their order subtotal. Put registration banner/link or send it to your friends, family, co-workers etc. The above referrals may then hand out their banner or link - just like you did. Any sale associated with their code now earns you 5%. The process repeats itself two more times with level-3 earning you 3% and Level-4 2%. In addition to your income from your own links, you'll continue earning on every your referral at any level (5+3+2) for the Life of our program! 5. How do I use my Available Credits to shop at 4-Hobby? 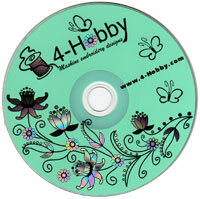 Simply log into your 4-hobby customer account and shop as you normally would. Once you go to checkout, you will see Bonus Points being automatically subtracted from your subtotal. 6. Do Bonus Points expire? No, currently not. If the Bonus Points politic will be changed, it will be announced at least 180 days before. 7. Is there a Rewards or Referrals limit? 8. How can I promote my banners? 9. Can I make a personal purchase using my own links? Yes. You'll receive 10% back to your partner account.